Reading: Rev. 1:1–8; John 14:1–3; Deut. 29:29; John 14:29; Rom. 1:7; Phil. 3:20; Dan. 7:13, 14. Memory Text: “Blessed is he who reads and those who hear the words of this prophecy, and keep those things which are written in it; for the time is near” (Revelation 1:3, NKJV). Reading: Rev. 1:9–18; Acts 7:54–60; Matt. 12:8; Exod. 20:11; Dan. 10:5, 6; Rev. 1:20; Rev. 2:1–7. Memory Text: “ ‘He who has an ear, let him hear what the Spirit says to the churches’ ” (Revelation 2:7, NKJV). Sunday (John Lomacang) - "On Patmos"
Monday (Shelley Quinn) - "On the Lord's Day"
Tuesday (Kenny Shelton) - "Encountering Christ on Patmos"
Wednesday (Jill Morikone) - "Christ's Messages for Then and Now"
Thursday (Ryan Day) - "Message to the Church in Ephesus"
Reading: Rev. 2:8–11, Rev. 2:12–17, Rev. 2:18–29, Rev. 3:1–6, Rev. 3:7–13, Rev. 3:14–22, Isa. 61:10. Memory Text: “ ‘ “To him who overcomes I will grant to sit with Me on My throne, as I also overcame and sat down with My Father on His throne” ’ ” (Revelation 3:21, NKJV). *This program was recorded prior to the final printing of the Sabbath School Quarterly. The daily topics and titles may vary. Sunday (Shelley Quinn) - "Christ's Messages to Smyrna and Philadelphia"
Monday (Ryan Day) - Jesus "Christ's Message to Pergamum"
Tuesday (Jill Morikone) - "Christ's Message to Thyatira"
Wednesday (John Lomacang) - "Christ Message to Sardis"
Thursday (Danny Shelton) - "Christians in Laodicea"
Reading: Rev. 4, Ezek. 1:5-14, Rev. 5, Eph. 1:20-23, Heb. 10:12, Acts 2:32-36. Memory Text: “ ‘Do not weep. 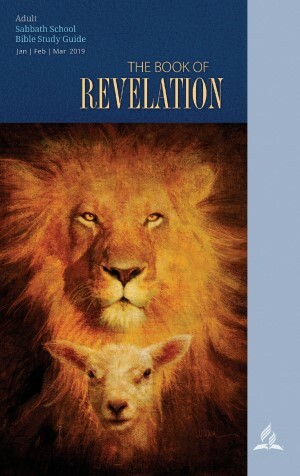 Behold, the Lion of the tribe of Judah, the Root of David, has prevailed to open the scroll and to loose its seven seals’ ” (Revelation 5:5, NKJV). Sunday (Ryan Day) - "In the Heavenly Throne Room"
Monday (Kenny Shelton) - "The Heavenly Assembly in the Throne"
Tuesday (John Lomacang) - "The Sealed Scroll"
Wednesday (Jill Morikone) - "The Enthronement of the Lamb"
Thursday (Shelley Quinn) - "The Significance of Pentecost"
Reading: Rev. 6:1–17, Lev. 26:21–26, Ezek. 4:16, Deut. 32:43, 2 Thess. 1:7–10. Memory Text: “ ‘You are worthy to take the scroll, and to open its seals; for You were slain, and have redeemed us to God by Your blood out of every tribe and tongue and people and nation, and have made us kings and priests to our God; and we shall reign on the earth’ ” (Revelation 5:9, 10, NKJV). Sunday (Kennt Shelton) - "The Opening of the First Seal"
Monday (John Lomacang) - "The Second and Third Seals"
Tuesday (Shelley Quinn) - "The Scene of the Fourth Seal"
Wednesday (Ryan Day) - "The Opening of the Fifth Seal"
Thursday (Jill Morikone) - "The Opening of the Sixth Seal"
Reading: Rev. 7; 2 Pet. 3:9-14; Deut. 8:11-17; Rev. 14:4, 5, 12; Rev. 17:5; Rom. 3:19-24. Memory Text: “ ‘These are the ones who come out of the great tribulation, and washed their robes and made them white in the blood of the Lamb’ ” (Revelation 7:14, NKJV). Sunday (Jill Morikone) - "Restraining the Winds"
Monday (Ryan Day) - "The Sealed People of God"
Tuesday (Shelley Quinn) - "The Great Multitude"
Wednesday (Yvonne Lewis Shelton) - "Those Who Follow the Lamb"
Thursday (John Lomacang) - "Salvation to Our God and the Lamb"
Reading: Rev. 8:1-13; Num. 10:8-10; Ezek. 10:2; Rev. 10:1-11; Dan. 12:6, 7; Rev. 11:1-13; Leviticus 16. Memory Text: “But in the days of the sounding of the seventh angel, when he is about to sound, the mystery of God would be finished, as He declared to His servants the prophets” (Revelation 10:7, NKJV). Sunday (Shelley Quinn) - "The Prayers of the Saints"
Monday (John Lomacang) - "The Meaning of the Trumpets"
Tuesday (Jill Morikone) - "The Angel With an Open Book"
Wednesday (Kenny Shelton) - "Eating the Scroll"
Thursday (Ryan Day) - "The Two Witnesses"
Reading: Rev 12; Gen. 3:15; Isa. 14:12-15; Dan. 7:23-25; II Thess. 2:8–12; Rev. 13:13, 14; Rev. 19:20. Memory Text: “ ‘And they overcame him by the blood of the Lamb and by the word of their testimony, and they did not love their lives to the death’ ” (Revelation 12:11, NKJV). Sunday (John Lomacang) - "The Woman and the Dragon"
Monday (Kenny Shelton) - "Satan's Permanent Expulsion from Heaven"
Tuesday (Shelley Quinn) - "The War on Earth"
Wednesday (Ryan Day) - "War Against the Remnant"
Thursday (Jill Morikone) - "Satan's End-Time Strategy"
Reading: Rev. 13, Rev. 17:8, Dan. 7:24, II Thess. 2:2-12, Rev. 12:14-16, I Kings 18:38. Memory Text: “Then the dragon was angry with the woman, and he went to wage war with the remnant of her offspring, who keep the commandments of God and have the testimony of Jesus Christ” (Revelation 12:17, MEV). Sunday (Shelley Quinn) - "The Beast From the Sea"
Monday (Jill Morikone) - "The Activities of the Sea Beast"
Tuesday (John Lomacang) - "The Beast Arising Out of the Earth"
Wednesday (Danny Shelton) - "The Image of the Beast"
Thursday (Ryan Day) - "The Mark of the Beast"
Lesson 10: “God's Everlasting Gospel"
Reading: Rev. 14:6-12; Matt. 24:14; Eccles. 12:13, 14; Exod. 20:2-11; Isa. 21:9; Isa. 34:8–10. Sunday (Jill Morikone) -"The Three Angels' Messages"
Monday (Ryan Day) - "The First Angel's Message--Part 1"
Tuesday (Yvonne Lewis) - "The First Angel's Message--Part 2"
Wednesday (John Lomacang) - "The Second Angel's Message"
Thursday (Shelley Quinn) - "The Third Angel's Message"
Lesson 11: “The Seven Last Plagues"
Reading: Rev. 15:1; Rev. 7:1-3; Rev. 14:9, 10; Rev. 16:1-12; Rev. 17:1; Daniel 5; Rev. 16:16; 2 Thess. 2:9-12. Memory Text: “ ‘Who shall not fear You, O Lord, and glorify Your name? For You alone are holy. For all nations shall come and worship before You, for Your judgments have been manifested’ ” (Revelation 15:4, NKJV). Sunday (Kenny Shelton) - "The Meaning of the Seven Last Plagues"
Monday (Jill Morikone) - "The Outpouring of the Last Plagues"
Tuesday (Shelley Quinn) - "Drying Up the Euphrates River"
Wednesday (John Lomacang) - "Satan's Last Great Deception"
Thursday (Ryan Day) - "Gathering for the Final Battle"
Lesson 12: “Judgment on Babylon"
Reading: Revelation 17, Jer. 51:13, Exod. 28:36-38, Rev. 13:1-8, Rev. 13:18, Rev. 16:2-12. Memory Text: “And I heard another voice from heaven saying, ‘Come out of her, my people, lest you share in her sins, and lest you receive of her plagues. For her sins have reached to heaven, and God has remembered her iniquities’ ” (Revelation 18:4, 5, NKJV). Sunday (Ryan Day) - "The Prostitute Babylon"
Monday (Shelley Quinn) - "The Prostitute Riding on the Beast"
Tuesday (John Lomacang) - "The Identification of the Beast"
Wednesday (Jill Morikone) - "The Seven Heads of the Beast"
Thursday (Kenny Shelton) - "The Fall of Babylon"
Lesson 13: “I Make All Things New"
Reading: Rev. 19:6–9, John 14:1-3, Rev. 19:11-16, Rev. 20:1-3, Jer. 4:23-26, Rev. 20:4-6, Rev. 21:2-8. Memory Text: “Then He who sat on the throne said, ‘Behold, I make all things new.’ And He said to me, ‘Write, for these words are true and faithful’ ” (Revelation 21:5, NKJV). Sunday (Jill Morikone) - "The Wedding Supper of the Lamb"
Monday (John Lomacang) - "Armageddon Ends"
Tuesday (Shelley Quinn) - "The Millenium"
Wednesday (Danny Shelton) - "A New Heaven and a New Earth"
Thursday (Ryan Day) - "The New Jerusalem"